Lockheed Martin and the U.S. Army will kick off field-testing in December of a lower-body exoskeleton designed to reduce users’ risk of injury and fatigue and boost their load-carrying capacity, Breaking Defense reported Thursday. 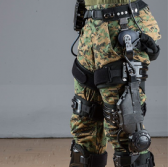 The ONYX exoskeleton unveiled at the Close Combat Lethality showcase at the Pentagon is classified as a technological readiness level 6 platform and is set to undergo three test cycles by the end of the year. The company and the service branch will also seek user feedback to facilitate redesign and testing work on the ONYX platform. Keith Maxwell, a program manager at Lockheed, said the company plans to deploy the technology offering by 2020. Maxwell said the company aims to further reduce the exoskeleton’s weight and ruggedize the technology to make its actuators and joints withstand water, shock and dust.